Do You Remember... "Adventures of Kit Carson"
The 101 syndicated episodes of “The Adventures of Kit Carson” played on TV like mini-B-western features. 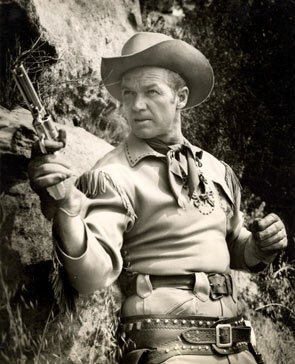 Starting in 1951, when B-westerns were still playing at theatres, and starring Bill Williams who had been seen in plenty of western films (“Cariboo Trail”, “California Passage”, “Great Missouri Raid”, “Last Outpost”), the “Kit Carson” half-hours were another great asset to the ever-growing group of TV range riders (“Hopalong Cassidy”, “Gene Autry”, “Wild Bill Hickok”, “Lone Ranger”, “Cisco Kid”), even beating “Roy Rogers” to the small screen by several months. Novak (Ken Maynard and dozens of westerns at Republic) knew their way around a horse and a six-gun as well. The casts, too, were peopled with B-western heavies (Roy Barcroft, Gregg Barton, Harry Lauter, Jack Ingram, John Cason, Tris Coffin, Terry Frost, Marshall Reed, Zon Murray, Lee Roberts, Pierce Lyden, Denver Pyle, I. Stanford Jolley, Harry Woods, Myron Healey, Holly Bane, Riley Hill, etc. ), leading ladies (Lois Hall, Nan Leslie, Sally Payne, Pamela Duncan, Evelyn Finley, Gail Davis, Donna Martell, Phyllis Coates, Linda Stirling, Jane Adams, Barbara Bestar, etc.) and character people (Tom London, Raymond Hatton, Stanley Andrews, Ed Cassidy, William Fawcett, etc.). Besides all this, locations like Corriganville, Iverson’s and Walker Ranch contributed to the B-western look. 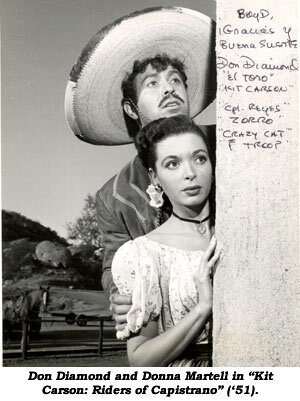 Kit had a humorous (if not a bit tedious at times with his overblown liking for the ladies) sidekick in El Toro as played by Don Diamond. Produced by MCA/Revue, four seasons of “Kit Carson” syndicated adventures (from August ‘51 to January ‘55) were sponsored nationally by Coca-Cola. Each episode opened with old-timer Hank Patterson recalling Kit’s fictionalized 1880’s exploits to a group of Coke drinking youngsters. Throughout the series veteran heavy John Cason doubled Bill Williams in the rough and tumble sequences. The question is often asked, “What was the name of Kit’s horse?” Not usually referred to by name, Kit did call him Chief in “Singing Wires”. Williams, born in the Hell’s Kitchen district of New York in 1915, finished school and was preparing for a career in construction engineering. In ‘34 and ‘35 he was a junior scholastic swimming champ, becoming a pro swimmer in aquatic revues of the ‘30s where he was noticed by a vaudeville producer who signed him as part of an adagio act. Williams even sang baritone with the Municipal Opera Company in St. Louis before touring Europe with his own adagio act. Coming to Hollywood, he had a long run with Earl Carroll’s Vanities before becoming an actor in “Murder In the Blue Room” (Universal ‘44). From there he was soon signed by RKO where he met Barbara Hale who became his second wife in ‘46. 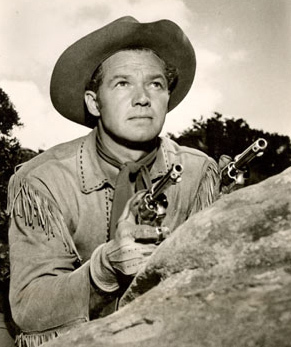 During and following “Kit Carson”, Williams appeared in many more screen westerns (“Son of Paleface”, “Rose of Cimarron”, “Pawnee”) even starring in several (“Apache Ambush”, “Wild Dakotas”, “Broken Star”). Although he continued to work sporadically through the ‘70s, he invested wisely in real estate which made him quite wealthy. Williams died in ‘92 at 77. Don Diamond (born 1921) worked continually through the ‘80s. 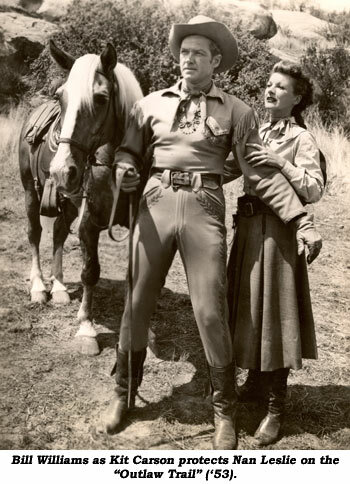 He was Corporal Reyes on “Zorro” (‘57-‘59) and Crazy Cat on “F-Troop” (‘65-‘67). Don calls Bill “a fine gentleman. I never had a harsh word with him. We went our separate ways after the series. I last saw him in ‘79 on ‘How the West Was Fun’, a western reunion show.” Diamond, 90, died June 19, 2011, of heart failure.